On August 23, 2011, a magnitude 5.8 earthquake hit the Piedmont region of the Commonwealth of Virginia, United States, at 1:51:04 p.m. local time. The shock wave from that earthquake started causing tremors in Northern Virginia and Washington, DC within minutes. Tim and I were at a sales meeting at the National Association of Tank Truck Carriers. Mid pitch the room started shaking. Immediately, my mind flashed back to the kindergarten lesson of how to stay safe during an earthquake, and I made a beeline towards the door frame. Meanwhile, 7 miles away in our DC office as the tremors shook the 50+ year old building, Zack had a different idea of how to handle the pending crisis. Fearful of the building falling down and our servers getting crushed in the rubble, he spent a few fearless minutes checking in all of his code to the cloud. 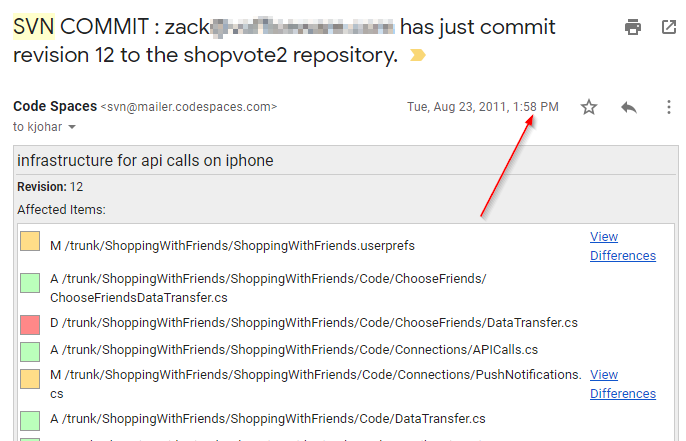 This is a screenshot of an email confirmation at the same time the shaking was at its peak. The thing about Zack is that his entire team knows they can count on him. They can count on him to give the best answer, to be the most fair arbitrator, and to be on hand when they need him. The thing his team doesn’t know about him is that there was a time no one knew he would be a leader. While I don’t exactly think that sacrificing one’s safety was the best move, it is one of many stories that define who Zack was before he became who he is. As I closed out 2018 and took stock of what I wanted to achieve in 2019 I learned that I was near burn out. I peeled back what was causing the burn out and realized that I was working with customers, working with staff, and working on the business. I decided for 2019 I’d spend the most time with staff and let the staff work with customers and work on growing the business. I was thinking about a future OpenWater. Tim would be in his mountain HQ3, I would be at the beach HQ2, and there would be a trusted team at HQ1. Perhaps this team would come from an outside partner who buys a stake in OpenWater or perhaps this team could be grown from within. In January, I launched the Leadership Anonymous meeting. We started the conversation talking about adjectives we would use to describe ourselves in the work place and then adjectives that we use to describe leaders we admire. Some of the adjectives that came up for leaders we admire include: Caring, Intelligent, Focused, Humble, Capable. The commonality between everyone’s stories were that the people they admired did more than talk, they spend their lives being the person they said they were. We felt the strongest leadership came from people who don’t show they are in charge but are still widely followed. As you’ve probably figured out from my other posts, one of the music duos I admire is Daft Punk. Their first album was titled Homework and on it was a track called Teachers. The track talked about the influences that molded their technique. On a repetitive electronic loop they list a DJ or music producer’s name followed by is in the house. As the track was released in 1997, I hadn’t heard of just about anyone on this list. Here is the first verse. The names I recognized are in bold. What surprised me the most about this list was Dr Dre is known to have influenced an entire generation of hip hop musicians, but Daft Punk to such a level, I never would have guessed. The first time I heard Teachers was actually in the 2008–2009 music scene with this song. In 2008 another DJ, Laidback Luke released a re-edit of the original. Here is the last verse from that song, with the names I recognize in bold. Just about all of them this time. This song was about the music producers that influenced LaidBack Luke while paying homage to Daft Punk that inspired the entire generation. So besides LaidBack Luke, it turns out the hip hop producer Swizz Beatz who produced for hip hop legends like Busta Rhymes, DMX, Jay-Z, and Kanye West, lists Daft Punk as one of his top influences. He used Daft Punk’s Technologic sample in Busta Rhyme’s Touch It. At some point the teacher became the student and student the teacher. The influences blend so smoothly that you reach this stage everyone is just learning and growing from one another. Daft Punk’s 2007 live concert version of Technologic used Swizz Beatz’s re-edit of their original work. Tim likes to say, “The rising tide raises all ships” which reminds me of Jordan’s grandfather’s idea of lifting people up from all walks of life. The end game is this pool of leaders cut from the same cloth of influences. To me, this is the ultimate reward of leadership. 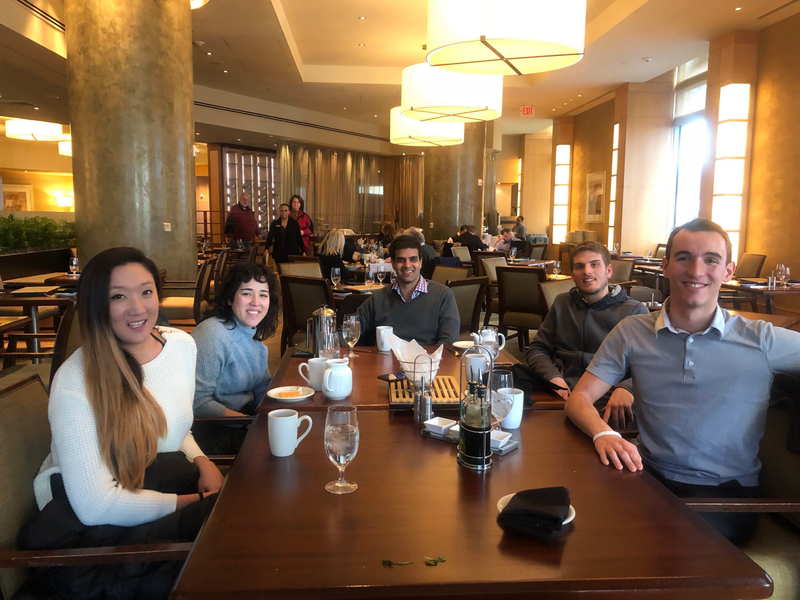 I’m excited to find out what kind of leaders the team at OpenWater will become, here and elsewhere in their long careers.